United pair Mark Connolly and scorer Calum Butcher celebrate after the winner against County last month. 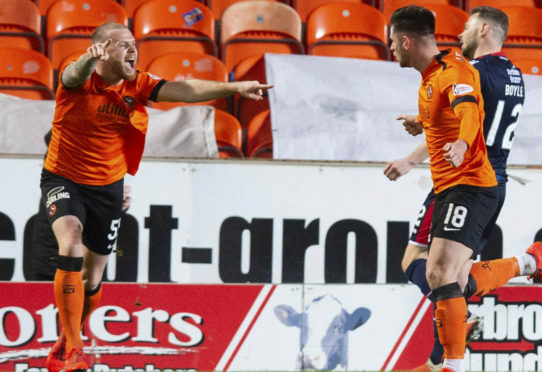 After falling flat again as they lost 2-1 at home to Queen of the South on Saturday, the Tangerines must beat the Staggies to retain any hope of winning the title. They have taken six points out of nine against County so far this season and Ian Roache looks back on the three fixtures between the clubs. This was the end game for United manager Csaba Laslo, who was sacked following this shocking performance. It was an utter humiliation for the Tangerines as they were totally hammered in front of their own fans. Former United man Billy Mckay scored a hat-trick as the Dingwall outfit netted five times. Pavol Safranko had levelled for United after Mckay’s opener but the hosts collapsed thereafter, with Sean Kelly and Josh Mullin also scoring. The Tangerines also played for the last half-hour with 10 men after Stewart Murdoch was shown a red card. The substitute lasted just three minutes before being sent off for an apparent stamp on Jamie Lindsay. The loss left fourth-placed United three points behind County, who occupied second spot, and five adrift of leaders Ayr United. If there is one result that should give the Tannadice men hope for Friday then it is this one. Victory saw them frustrate the life out of the Staggies with a dogged and determined single-goal success in Dingwall. Defender Paul Watson managed to get on the end of a Fraser Aird freekick to shoot United ahead. Roared on by a loud and large travelling support, United dug in defensively to move just one point behind County with both having played 13 matches. By the time this game came around, United had fallen far behind in the promotion race and could have gone 14 points adrift of leaders County with a loss at Tannadice. Instead, the Tangerines cut the gap to eight points thanks to Calum Butcher’s seventh-minute goal. The midfielder headed home from a corner to clinch another 1-0 victory and end County’s six-game winning run in the league. The scoreline could have been more impressive had Nicky Clark converted a late one-on-one chance. United held on to keep the title race alive with eight games left and both sides having played 28 games.